So onto 2016 and new promises to myself. 2016 will see big changes in our house. Child 2 will leave the nest and hubby and I will be back together in coupledom. We were only married two and a half years before we had Child 1, so this is a new chapter. I hope, that with it, I can also indulge myself a little more. More books in 2016 than in 2015 certainly, but maybe I should aim for 30 rather than 40! Perhaps we can have a few weekends away and add to the book tally in that manner! But back to the present. After The Lion, the Witch and the Wardrobe last month, I have continued to redress the lack of CS Lewis in my childhood canon. 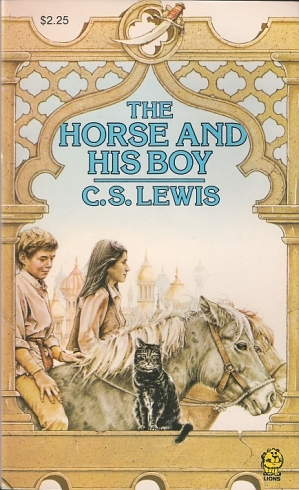 The Horse and His Boy was an enjoyable children's title. Its morality is evident and the fair minded always win through. Christian allegory is less obvious in this one, but Aslan retains his authority with powers to protect and to punish. I liked the personal nature of Aslan in this text; he refuses to give any details about other people; "I am telling you your own story, not hers. I tell no-one any story but his own." This integrity has real comfort behind it and alludes to the personal relationships that can be achieved with Jesus. Similarly the description of Aslan as "Myself" echoes the biblical "I am" of Old Testament teaching. "It was from the lion that the light came. No-one had ever seen anything more terrible or more beautiful!" Here, allusions can be traced to the gospels and to the final book of the bible. CS Lewis conveys awe with childlike simplicity, conveying the magnitude of his lion protagonist. In all this however, we cannot forget Shasta, the child hero of the day. He is honest, kind and wholesome! He sits well with the creation of Susan, Peter et al from the previous novel, and his adventures are fun. The talking horses are a feature, with the haughty pedigree Bree learning a lot from the more humble Hwin. And onto my Christmas present. Most of my family are reluctant to choose me books unless I have specified author or title, but child 2 has proved game to investigate my preferences. Looking at it on Amazon, The Tea Planter's Wife has received good reviews and the "you may also like" section contained novels I have previously enjoyed. And so I set myself the challenge to complete it within this year, and finished it about half an hour ago! It centres around a young newlywed, Gwen Hooper, who begins the novel by travelling to Ceylon to be reunited with her tea planting husband. She is enthralled by the whirlwind romance experienced in England and is determined to settle into his environment. The novelist, Dinah Jefferies, is new to me, and she evoked Ceylon and the plantation mansion with credibility. The sultry heat and consuming rain are background features that add to the authenticity of the geography. The plot is complex; it has some twists and turns, but they are not overly subtle and can be said to be predictable at times. To suspend disbelief, you need to accept the book as a good story rather than an elegant one, and you need to accept fully the naivety of the central character. For it is naivety that creates much of the tension, and with this comes a profound fear of loss. This is set against a background of shifting racial questions and the more fundamental realisation that tea pickers and native workers are human and worthy of consideration and respect. Set between the 1920s and 1930s, the novel reveals the shifting ideas of the world as the Empire builders began to recognise the audacity of their colonisation. This sounds like a heavy political substrand, but it is not. It is a nod to the times, and a clear recognition that the conflicting feelings and views held by Gwen are representative of changing and more progressive times ahead. This was a good light read to end the year. And onto 2016. What shall tempt me first? I bought several prize listed novels recently, and I think I may begin the New Year with A Spool of Blue Thread by Anne Tyler. Please continue to read my reading thoughts, and feel free to add your own recommendations to my reading list. Here's to more than 23 titles in 2016! Cheers! I read the Chronicles of Narnia for the first time this year too! How coincidental! Loved them all and would happily reread and reread again and again. My favourite was "The voyage of the dawn treader", mainly for the character of Reepicheep.